This is the story of a remarkable man, a loving Father, a Guide, Philosopher and Friend to many, by members of his family who take this opportunity of expressing their gratitude for his loving care in their upbringing. 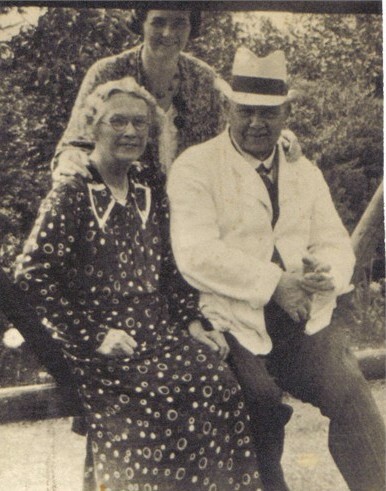 James and Mary Brittain were truly very humble people who dwelt at Kempston in Bedfordshire. They were married in 1853 and had seven children, three of whom died in infancy leaving Fred, Hetty, George and Frank. The family had a hard time in their upbringing but they were sustained by a faith in God within the MethodistChurch. Grandpa James was a sawyer by trade. He died in his 79th year. At his funeral in 1908 the shed in the garden was found to be absolutely full of logs which he had cut up for Grandma Mary to use in case he died first. Grandma died a year later. We of his family and a number of friends pressed Father to write details of his life story and in his ninetieth year he did so calling his story “The Musings of an Octogenarian”. “My education began at a village school in Bedfordshire at a cost of one penny per week, and continued until I had attained the age of thirteen and a half years. Having then reached the top of the first class and gained the highest prize, a real golden sovereign, it became a question of what my future should be. My schoolmaster, a fine old gentleman named Dean, interviewed my parents urging that I should enter the scholastic profession by becoming a pupil teacher as, he declared, I was an apt pupil, having passed the sixth standard, the highest the school taught. Neither my parents or myself looked with favour on this project, the fact being they could not afford it, and earnestly desired and needed that I should get to work to bring some little help to the meagre family income. Born into a family of three boys and one girl, I am fully aware of the heroic struggle my parents had for many years to keep the wolf from the door. Once only the wolf entered, seized the furniture, beds and bedding and, as my mother informed me, we children gathered around her and cried to go to bed, but there was none to go to. My father had unwisely stood surety for a friend for twenty pounds, and the friend failed to pay. Failing which, they seized our goods and chattels. However, my parents were of the persevering kind and gradually made good. My parents were lifelong Methodists and we children all belonged to the Methodist Sunday School. Not only that, but they were all pronounced Liberals in politics. Quite early in life I began to imbibe those same principles (I had listened to Joseph Arch, the first Labour Member of Parliament, on the village green). We grew up a happy, united, harmonious family and nothing but death has ever intervened into it. My school days being over, my father said to me: “You must find some work, I can’t have you lobbitting about home, doing nothing”. My schooldays being over, my father said to me: “You must find some work, I can’t have you lobbitting about home, doing nothing”. Hill, Higgs & Hill, had commenced the contract of building the Bedford barracks, and within a mile of my home. Entirely on my own, I went very shyly, saw the manager, a Mr. Seward, and asked him “could you give a job sir?” “Yes, my boy,” said he smilingly. “We’ll give you a job and you can start tomorrow morning. Your money will be five farthings per hour”. Oh, with what joy I bounded home to tell the good news, this meant five shillings tenpence halfpenny per week! Little did I think that for the next thirty to forty years I had found so great a friend as the manager proved to be. The work was hard for a boy so young, and the hours long, from six o’clock in the morning until five-thirty at night, and consisted chiefly of carrying a watering can and keeping the bricks damp before being laid. That was in 1875; wages were low, mechanics fivepence halfpenny and labourers fourpence per hour. For two whole years I worked there, saw the buildings grow from foundations to completion, and was the last employee. My friend, the manager, then said: “George, my boy, I’ve spoken to the head of the firm about you, and if you care to come to London we will teach you any trade you choose, or you can go straight to the head office. It’s to be your choice”. Of course, I warmly thanked him and said that I would come, but I wanted to be a bricklayer. He smilingly said: “You think it over, but I think the office will be the best”. So far so good; but when I got home and imparted the good news my mother said: ‘”Oh, I cannot let you go to that dreadful London. No, No!”. When my father came home he thought there was plenty of building in Bedford; I need not go to London. Every attempt to dissuade me from going was made, but I had a conviction it was my life’s opportunity. Here let it be clearly understood, I was already a full member of the Methodist Church, and both my minister and my class leader joined in the protest of my going to such a dangerous place as London. The day came, May 28th, 1877. I was almost fifteen and a half years of age. Father and Mother came to see me off at Bedford station. I had taken my savings out of the bank; twenty seven shillings in all. Father said: “George, my boy, here is four shillings to pay your fare to London. It is all I can do”. And then, with some misgivings and tears, we parted, I to the office of the same firm, who had secured a three years contract at the military barracks at Woolwich. My friendly manager was away for a few days. I saw the head clerk. He told me to go and get lodgings and be at the office next morning, and that my wages would be threepence halfpenny per hour or sixteen shilling fivepence halfpenny per week. Father had considerable difficulty in finding lodgings. I was sent on a job where the men were working overtime. All went well for a day or two, and then the men wanted to know more about me. And when I disclosed the fact that the manager was a friend to me and had sent me there they at once charged with being a spy, and concluded that I was a secret time-keeper. I went to my lodgings very, very sad, and longed to return home. I took the Bible my mother had packed with my belongings and opened it, casually as I thought, but directed as I believed, on the 37th Psalm, which began, “Fret not thyself because of evil doers – Commit thy way unto the Lord, Trust also in Him and He shall bring it to pass”. What an inspiration that was to me. I lived on it, and decided, come what would, I’d stick it. At the age of 22 I married my Bible class leader’s daughter, Emily Jane Hancock, and moved from Woolwich to Lambeth. On transferring my Church membership my Woolwich friends gave me three books which I greatly value. Inscribed within were the words “He shall direct thy Paths”. Life is not such a haphazard thing as many believe. I have believed and rely upon it, “He careth for you”. That was in September, 1884, and my membership in Lambeth still stands. I had now become a competent tradesman and was sent by my firm, which had now become Higgs & Hill, to selective jobs all over London, and placed in charge of works. On one occasion I was sent to do some work at a boy’s school at Godalming and, on one of the roads inside the grounds, I picked up a purse of money. I took it straight to the headmaster’s office. He was rather struck that a bricklayer should be so honest, insisted on my accepting a reward, and wrote to my firm on the matter, whereupon I was called into the head office and thanked by the governors. I then began taking piecework so dear to the heart of an energetic mechanic – but repugnant to the Trade Unions. In every case I was successful in reaping a bit of extra money for myself and helpful to the firm. Among them was a delightful little church I built in Addlestone, Surrey. I enjoyed the full confidence of both Mr. Hill and Mr. Higgs, and did considerable work at each of their homes. In the early part of 1889 a seemingly great disaster fell on me. A clot of snow slipped me up, jarred and injured my knee to such an extent that I was rendered incapable of work for some thirteen months. My first child was then about four years old. Alec is now proprietor of the business of Geo. Brittain & Sons, Kennington, S.E.11. My second child, Nellie, was born in the midst of my trouble. For six months I was on crutches and it seemed as if blue ruin faced me. My only income was £1 per week from my benefit club, which I had wisely joined some years before. My workmates got up a concert for me at the ‘Horns’, Kennington and handed me £20 as a result. My life’s savings had disappeared (except £27) and I was incapable of ladder work. I felt compelled to resign from Higgs and endeavour to start a small business on my own account. I therefore communicated that fact to the firm and Mr. William Higgs, that most gracious gentleman, came to see me, bid me God speed in my endeavour, would guarantee the rent of my workshop, and would gladly reinstate me if I was able and it became necessary. In short, any time I needed help I was to call upon him. My first job was to re-point the brickwork of a mission hall. The second, to build a small factory in High Street, Lambeth. I gradually grew stronger, work poured in, and I never had to be sorry for the step taken. During the 1880’s and up to the first decade of 1900 there existed in this country what was termed “the Nonconformist Conscience”, and it acted most effectively in the political life of our country. I joined the Kennington Liberal Association, and later became its president. In 1898 the Lambeth Free Church Council urged me to stand as candidate for municipal honours. I agreed and won a seat on the Lambeth vestry. In 1900 the vestry was constituted a borough council. Little then did I think that for the next 40 years I should be fully engaged in the social and religious life and work of Lambeth. I became Councillor, Alderman and Mayor of the Borough, Guardian of the Poor for 20 years, was nominated by the Minister of Health as a member of the Metropolitan Asylums Board and became its vice-chairman. Appointed Justice of the Peace in 1915 and retired in 1950. I became Chairman of the Lambeth Trustee Savings Bank, and later, Chairman of the London Trustee Savings Bank, and its president from 1945 to 1949. I was Chairman of the Commissioners of Taxes for Brixton for 10 years and held a number of other public offices, in all of which I spent a most enjoyable and, I believe, useful life. Parallel with my public work, which I regarded as my sole recreation, the business of Geo. Brittain & Sons was growing as strong and firm as my limited capital would allow. By invitation, I became a contractor to the Duchy of Cornwall, had interesting interviews with Royalty, and was presented as such to His present Majesty. On February 6th 1951, I had the very great pleasure of attending the Diamond Jubilee meeting of my firm at the Oval and met many old employees, some of over 50 years standing. In the year 1890 I married Miss Emily Barton, of Dunstable. 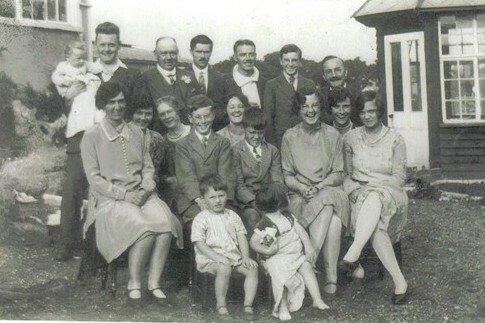 At first we lived at Kennington, where she became the mother of my three children, Richard, Muriel and Rebecca, each of whom in turn has supplied me with grandchildren – God bless them! 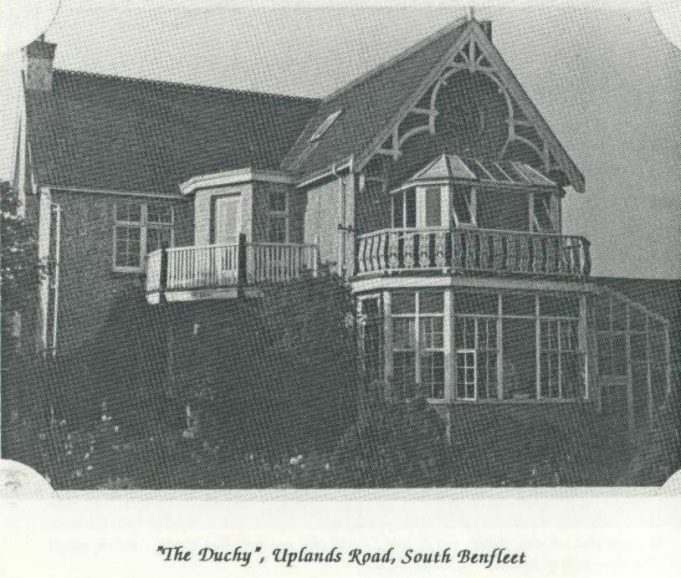 We moved to South Benfleet where, after 39 years of extremely happy life, my wife died, leaving organisations which she had started and which still survive, and many happy blessed memories far and wide. Thus my life has been a somewhat chequered career, but through it all I have been conscious of the Guiding Hand of God, and gladly acknowledge His still controlling Love and Care. “I’ll bless the Hand that guided. I’ll bless the Heart that planned”. My life has been full of wealthy friendships, and I trust the love and harmony that have always existed in the whole family and that will ever continue to the end”. That is the end of Father’s “Musings”, but here follows a list of some of Father’s public activities which has been provided by Bruce Penny the then Town Clerk of the Borough of Lambeth. Mr Alderman Geo. 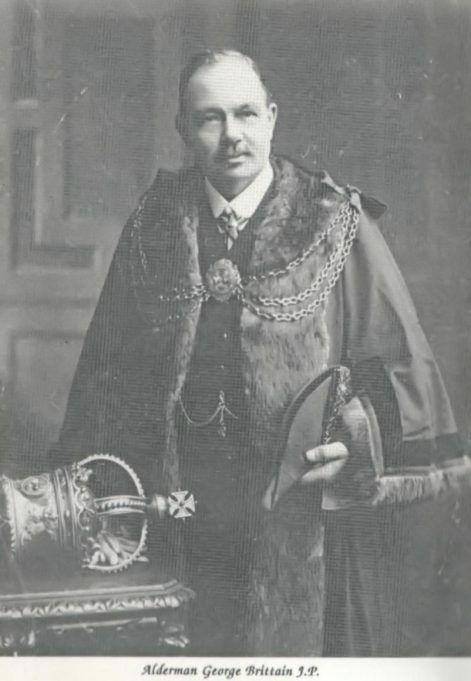 Brittain, J.P.
Elected Mayor of Lambeth, 10th November, 1919; Retired 9th November, 1920. Has been on the Lambeth Borough Council and the Vestry preceding it for upwards of 20 years. Was a member of the Tribunal from its inception, 9th November 1915 to its completion. Is Chairman of the Lambeth Assessment and General Purposes Committees. Has raised for Housing Bonds considerably over £80,000. Has raised for Imperial War (Central Europe) Fund upwards of £500. Has raised for Hospitals etc., £790. Is Chairman & Trustee of Lambeth Savings Bank, which has existed for upwards of 100 years. Has been a Guardian of the Poor for over 17 years, and for 15 years Chairman of the Board’s Works Committee. Has been a Justice of the Peace since 6th July, 1915. Has been a member of Metropolitan Asylums Board since December 1917, and is Chairman of the Plans Committee. Is a member of local Committees, such as War Pensions, Lambeth Pensions, Local Advisory, Arbitration, etc., etc. Is a member of Executive of London Master Builders’ Federation. Has recently taken part in the successful acquisition of a large addition to Kennington Park at a cost of £40,000. Devotes greater portion of this time to Public Life.